Keighley Amateurs – Join Us! 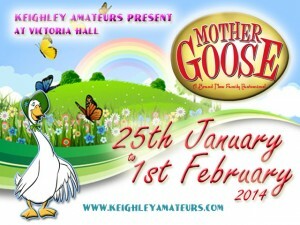 Victoria Hall, Keighley – 25th January to 1st February 2014. Many of your Keighley Amateurs favourites are back, including the spectacular principal boy/girl team from Robinson Crusoe and Aladdin – Fiona Spencer and Brogan Hollindrake. Check out our Join the Amateurs! Check out our Support Us - Superheroes Needed! Copyright © 2019 Keighley Musical Theatre Company. Powered by WordPress. Theme: Spacious by ThemeGrill.